I stroll through the Norwich University of the Arts. 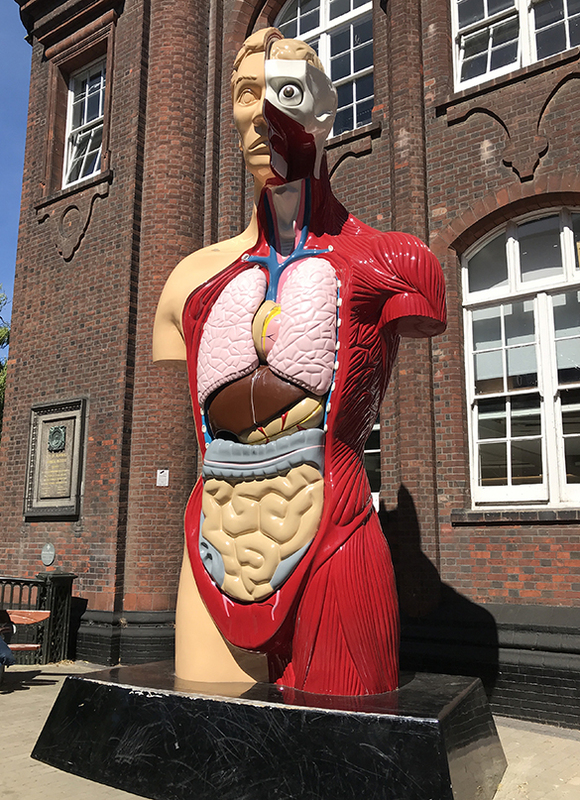 A massive skinned, dissected figure outside the St George’s building stops me in my tracks. Bells from my anatomist past are jangling. Is this now the Norwich School of Medicine? I ask at the reception desk what this is about. “Oh!” the nice lady replies with just a hint of condescension, “That’s Damien Hirst!” Ah!…. Silly me! I should have known. 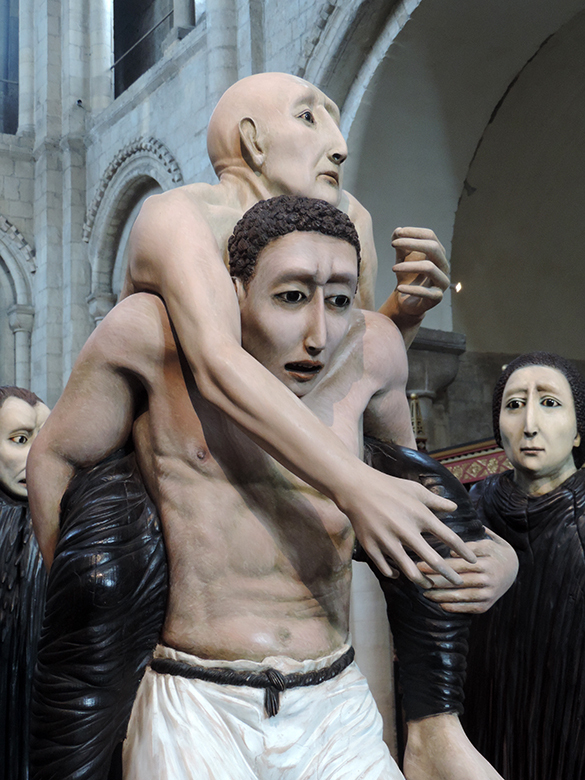 I learn that, unsurprisingly, the 7 metre high Hymn (play-on-words “Him”) caused controversy when first displayed. Is it “art”? (Pushing the boundaries etc. Same old!) Furthermore, it was claimed to be a direct copy of a 25cm educational toy; this resulted in a quiet financial settlement. Nevertheless, Hirst came out of it well by selling the sculpture to Charles Saatchi for £1 million. My last thought is: yes, Damien Hirst does it again whatever “it” may be. But then I’m sure that he couldn’t possibly give a damn what I think. I am in Norwich, England. A fine city! At it’s heart one finds the cathedral and nearby the cobbled and film-set charming Elm Hill. There nestles Mandell’s Gallery; an unpretentious, quiet and tasteful contribution to the city’s cultural on-goings. The current exhibition DRAW is refreshing, unusual and well worth a visit. I wouldn’t describe this cartoonish self-portrait by Stuart Pearson Wright as beautiful. It is technically accomplished and arresting in its awkwardness. First I notice the clenched fist (anger?) that is as prominent as the gloomy face. Then I ask myself why Wright has placed his casually dressed self partly out of the frame. 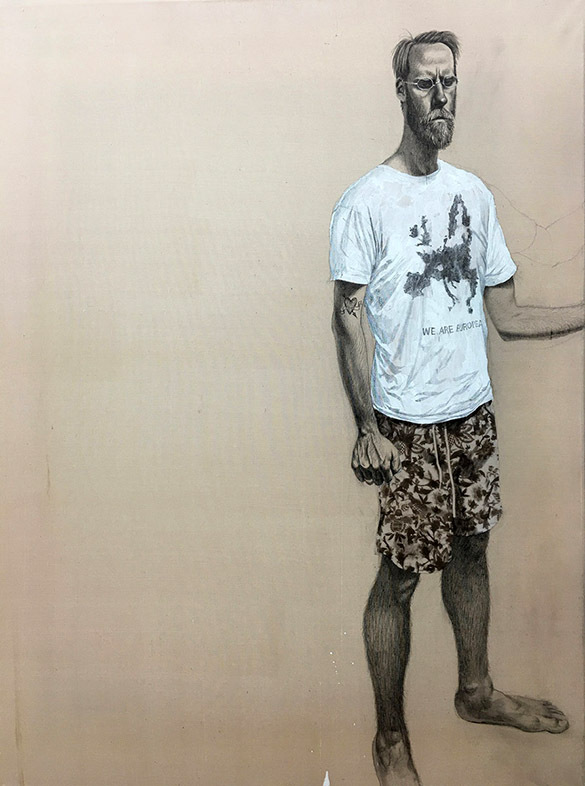 Then I need an explanation for the outline of another left arm (but this would be his – possibly undecided – drawing right arm seen in his mirror.) The image is full of anxiety, confusion and ambiguity. And then I notice the scribbled map of Europe on the t-shirt and the sub-text “WE ARE EUROPEAN.” And then I re-read the title and it all makes sense and I realise that this is master-class portraiture. One of the exhibition’s curators, Paul Fenner, says about drawing that “Far from being a question of the application of a neutral “skill,” this universal ability to transmute the visible world that surrounds us into another order of visibility is nothing less than a fundamental mystery of our incarnation, our being-in-the-world.” I have to agree when looking at Christopher Wallbank’s truly amazing, tall and detailed drawing of a cliff-hanging guillemot colony. Wallbank viewed this nesting colony through binoculars. 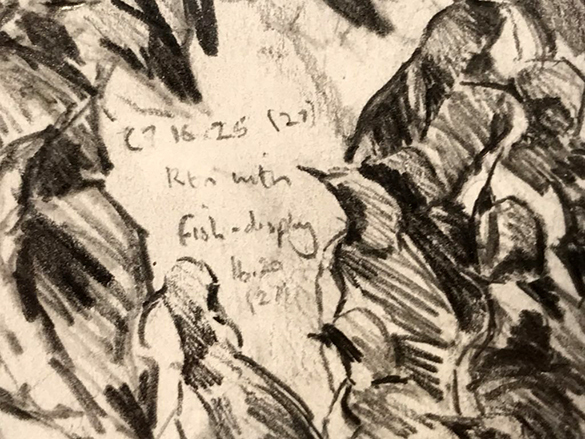 He recorded his observations with multiple drawings and noted the behaviour of the guillemots. Only on close-up are his multiple notes visible as is that amazing ability to capture with the simplest of lines the essential and word-defying features of any given bird species. 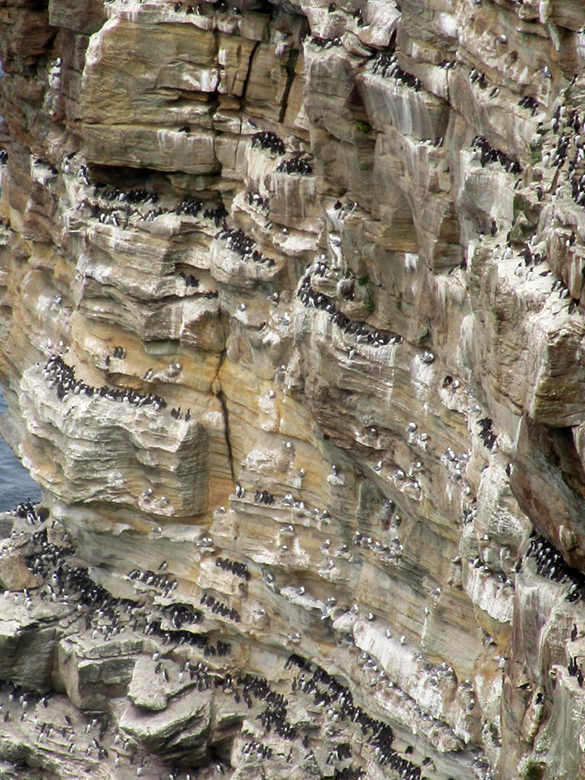 Just for reference, here’s a photograph I took recently of a mixed colony of guillemots, razor-bills and falmers at Dunnet Head in Caithness, Scotland. The exhibition closes on 21st July. So hurry along! I am due to meet Susan Gunn at the opening of her new exhibition at Mandells gallery in Norwich. I look around. The canvases are stylish. The whole show is calming. The press dossier tells me that Susan was born into a Bolton mining family in 1965 and that she gained an Art Degree at Norwich. It details countless exhibitions, commissions and prizes including, in 2006, the Sovereign European Painting Prize. Friends and admirers arrive. Journalists vie for Susan’s attention. She has that rare quality of being able to soak up admiration whilst making it all feel like friendship. Fortunately for me, she is generous with her time. I tell her that Talking Beautiful Stuff is about the narrative behind beautiful stuff that creative people do. She allows me to dig a bit. Her own narrative of the journey from Bolton to Mandell’s is recounted with lucidity and modesty. It is an eye-watering story of talent and success winning over loss and sadness. A “special gift for art” was noticed by a school teacher. She went on to, and soon dropped out of, Bolton Art School. She set up a successful wedding dress company. She fell in love. She moved to Norwich. She married. She became a student again. She became a mother. She lost her daughter. She suffered an immense grief. She managed to pick up both herself and her family life. She then returned to painting. Her most recent accomplishment is a commissioned 20 metre work for the Enterprise Centre at the University of East Anglia (“one of the greenest and most sustainable buildings in Europe.”) “Terra Memoria I S,” a smaller version, is part of this exhibition. I ask Susan what three words apply best to her work. “Earth, infinity..” she reflects for a few seconds “.. and death.” She talks about how her father couldn’t remove all the coal dust from under his fingernails, the near-spirituality of whiteness, her ritual polishing of a certain grave stone and how, with her work, she aims to forge a link between age-old techniques, things primitive, nature and contemporary painting. Everything is rational. There is no artspeak. 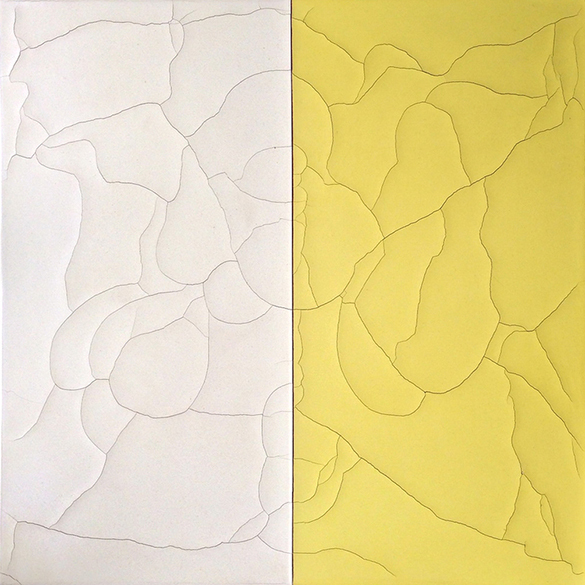 All her paintings carry a visual theme of natural colours with polished surfaces riven with cracks. The appeal is immediate; some fundamental matter is fractured but nevertheless holds together. There is a promise of recreation; of good things. The contrast between the clean crisp lines, the colours and the organic, complex forms is mesmerising. I am drawn into a kind of imaginary space where Susan insists that I stop and reflect on the cracking paint of a lovely old shed or sun-dried riverside mud. My imagination advances; the cracked paint and the fissured mud are cleanly cut into precise rectangles on her studio floor. I ask Susan about her influences. 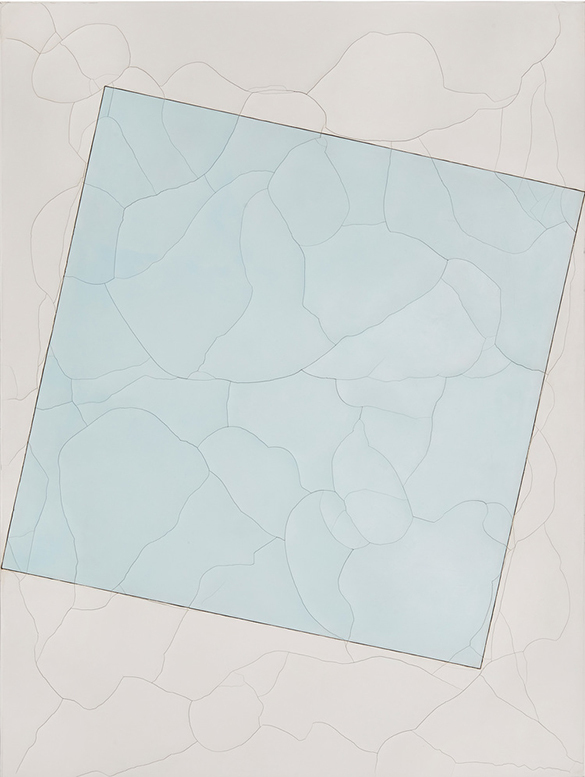 Top of the list is Alberto Burri who executed a number of “cracked” paintings in the 1970s. The process that Susan has mastered involves age-old materials and techniques. She employs a traditional gesso made of chalk and an authentic glue binder. Its propensity to crack is usually regarded as an undesired flaw. However, she remembers the thrill when she first noticed the complex beauty of fissures appearing in her paint. This was her moment. This was a recall of past, earthy and heartfelt things. Since, she has learnt how the apparent randomness of the cracks in her gesso can, to an extent, be pre-determined by the tension in the canvas, the amount of water in the mix and the ambient room temperature. The natural pigments include coal dust (unsurprisingly,) cochineal, lapis lazuli and suffolk linseed. The final stage involves grinding and waxing the surface by hand. As we talk, I look around at her paintings. The highs and lows of her life, the evolution of her process and the aesthetic outcome of that process are three intertwined and interdependent strands of one uplifting narrative; one strand can only be appreciated in the light of the other two. 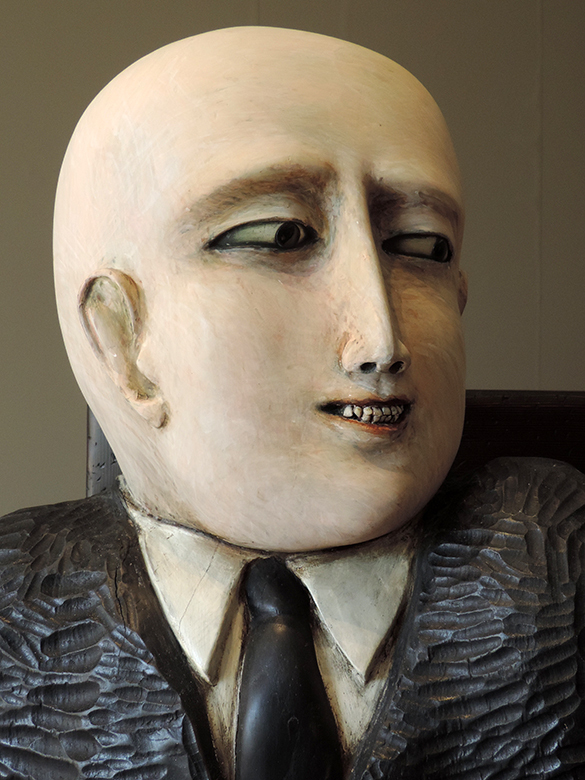 Inevitably, I become another admirer of Susan Gunn and her work. Meeting her is a rare privilege. I revisit my school-boyhood by wandering around Norwich Cathedral. The ecclesiastic, stoney-musty ambience evaporates as I turn into the vast building’s north transept. 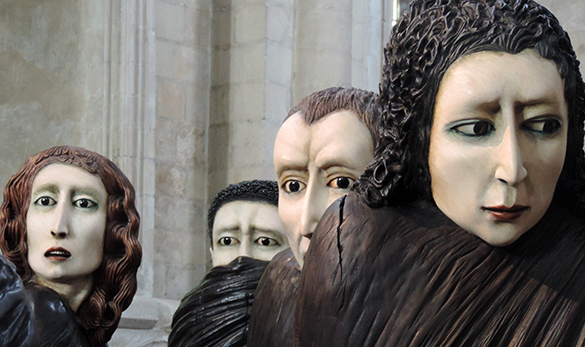 Under those near-one-thousand-year-old single-centered arches I find a sculpture that is beautiful, astonishing and haunting. I am transfixed by these life-size figures illuminated by stained-glass sunshine. Other visitors stop and stare. I am sure that they too have a torrent of questions in their minds. What does it mean? How was it done? Why is it here? In hushed voice, a man asks his young son “What do you think of that then, Tommy?” After a few seconds of thought, the boy replies “Brilliant!” And it is. But I would love to know what he means by this. The other eight figures are also carved in one-piece. They are cloaked in ebony black. The eyes are onyx. The faces are exquisite, multi-ethnic and anxious. One person’s pain is clearly felt by the others. “Shadows of the Wanderer” is about exile, migration, vulnerability and above all fear. Ana Maria Pacheco was born in Goiana in Brazil in 1943. She witnessed the cruelties and injustices of life under a military junta from 1964. In 1973, on a British Council grant, she won a place to study at London’s Slade. She went on to merit appointment as director of Fine Art at the Norwich School of Art (now the Norwich University of the Arts) from 1985 to 1989. 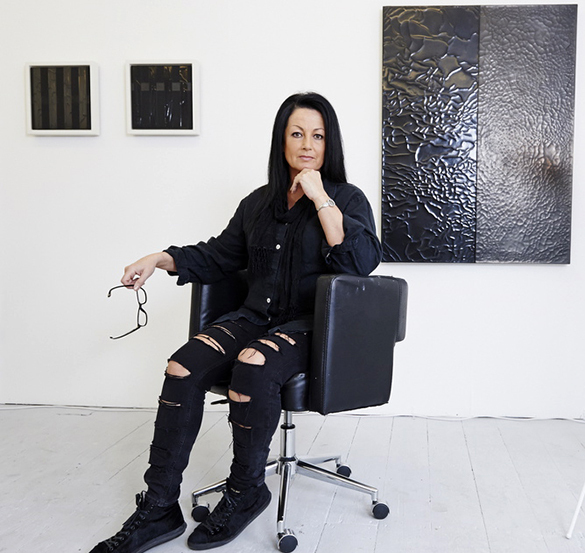 She has exhibited at many of the major institutions in the UK including the British Museum, the Tate Gallery and the Victoria and Albert Museum. Remaining close to her outraged roots, a central theme in all her work is the abuse of control and power and the vulnerability of the victims. So take a look at what I find when I cross the footbridge to the gallery at the NUA! I wander around these figures. Again, the lifeful onyx eyes. No one is looking; I place a hand on the shoulder of the host. I feel no unbidden pulse of sadistic energy. But then I recoil with a bizarre mixture of disgust and admiration. Each figure’s mouth has real teeth implanted in its woody gums! Norwich: a fine city! 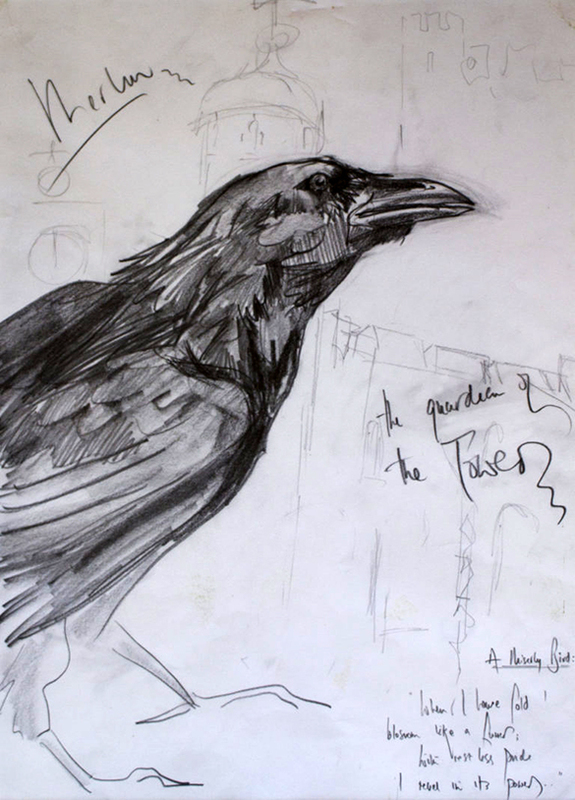 Ana Maria Pacheco is something of a rare and exotic bird for this very English place. Her technically accomplished work is like nothing else. It incites a tangle of emotions. It is impossible to point at influences. It draws on folklore, biblical myths, carnival, love, family, death and violence. Its human face recalls the amerindian, african and european ethnicities of Brazil. Above all, it is, as young Tommy said, brilliant. Utterly brilliant. 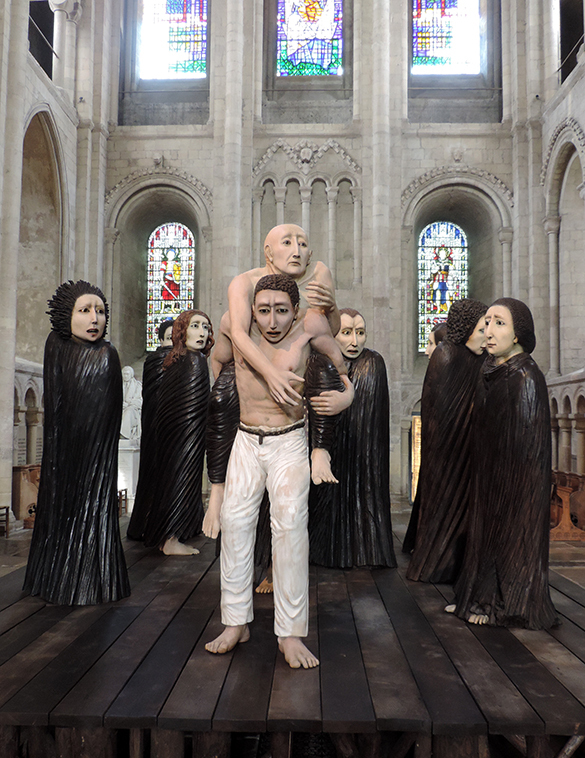 “Shadows of the Wanderer” and “The Banquet” are part of a four-way interlinked exhibition celebrating this versatile sculptor’s work in Norwich. The other locations are Norwich Castle Museum & Art Gallery and the Cathedral of St John the Baptist. Hats off to the curator, Keith Roberts!